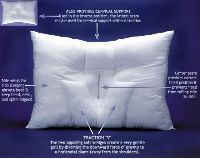 The Arc4life Cervical Traction Neck Pillow is a great pillow for aligning your head and neck in the proper position for sleeping at night. 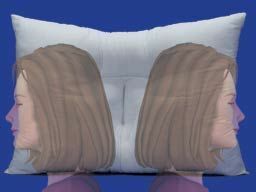 This pillow has two sides to sleep on: a traction side and a support side. 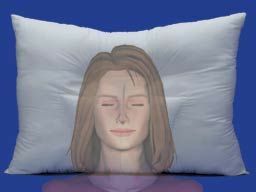 The traction side of the pillow will give you a gentle stretch in the spine when you sleep. If you have been diagnosed with no curve in your neck or a "military neck", the Arc4life Cervical Traction Neck Pillow is the right pillow for you. Great for patients who suffer from degenerative disc, arthritis, herniated disc, or a bulging disc in their neck. Dimensions: Standard: 24" x 17"
Finished Size: 24' x 17"